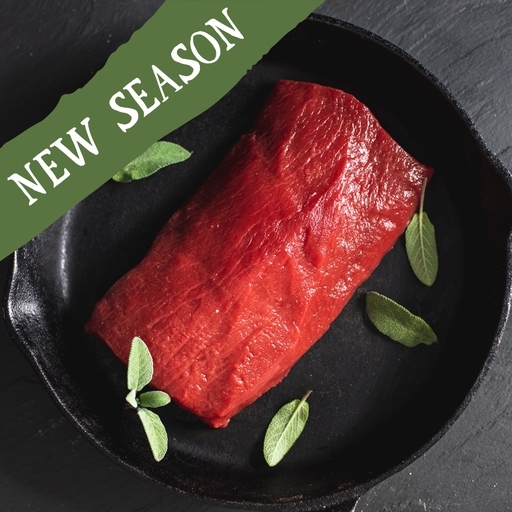 A full-flavoured loin of organic venison, reared on West Country farms and prepared in our butchery. Tender, succulent and lean, this is a fantastic cut – and very versatile. Sear in a hot pan, finish in the oven, then slice into juicy steaks. Or make a luxurious venison Wellington for a special occasion; good with wilted greens or a watercress salad. Serves 4. Our organic meat delivery is in insulated packaging to keep cool on your doorstep. Preheat the oven to 220˚C/Gas 7. Season the meat. Heat 2 tbsp oil in an ovenproof pan. Fry the loin for 1-2 mins on each side to brown it. Transfer to the oven for 7-8 mins, for medium. Remove from the oven. It should feel springy to the touch. Rest somewhere warm for 5-10 mins before slicing. Or use the loin to make a venison Wellington.